The proteasome is the proteolytic machinery of the ubiquitin-proteasome system (UPS), the main pathway responsible for degradation of intracellular proteins. As the major cellular protease, the proteasome is a key player in eukaryotic protein homeostasis and dysregulation of the UPS has been involved in neurodegenerative diseases and cancers. Because of this, protea-somes have been identified as therapeutic targets, especially for some cancers. Therefore, understanding the structure/function relationship controlling proteasome activity is of major interest in biology. Proteasomes complexes consist of a 20S catalytic core particle (CP) comprising 14 to 17 different proteins, either single, or associated to one or two regulatory particles of identical or different protein composition (Figure 1). In mammals, four activators have been identified, the 19S regulatory particle (RP), PA28α/β, PA28γ, and PA200. The 26S proteasome is a particular form where the 20S CP is capped by two 19S RPs, forming a 2.4 MDa complex; it is involved in the ubiquitin-dependent degradation of proteins. 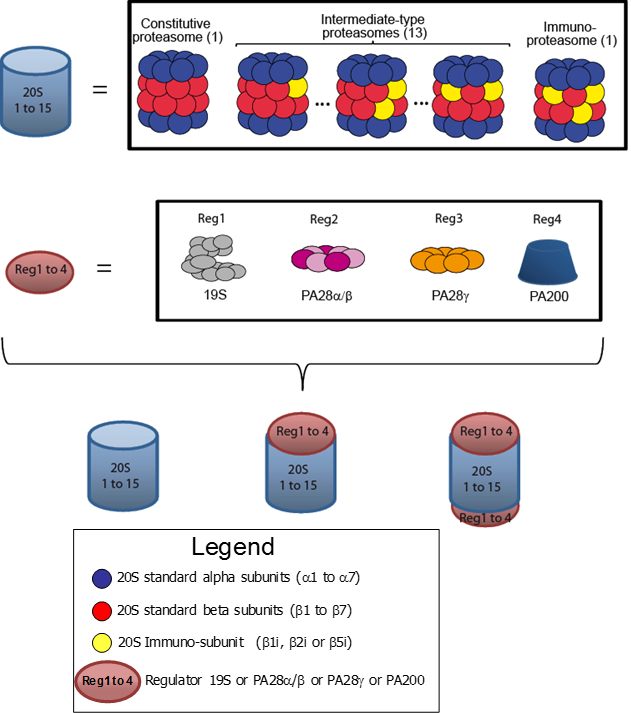 Hybrid proteasomes correspond to forms where the 20S CP is capped with two different regulators, mainly 19S RP and PA28. The association of the 20S CP with its different regulators is ensured through the two α rings, which also regulate the entry of substrates into the CP. The eukaryotic 20S CP is composed of 14 different subunits organized in barrel-like structure of four stacked rings (α7β7β7α7). The two β rings contain each 3 catalytic subunits, β1, β2, and β5, which are totally or partially replaced by the so-called immuno-subunits, β1i, β2i, and β5i, in the immuno-proteasome or intermediate-type proteasomes. The catalytic subunits are responsible for three main proteasome proteolytic activities (trypsin-like, chymotrypsin-like, and caspase-like), which can be modulated by the replacement of standard subunits by immunosubunits. 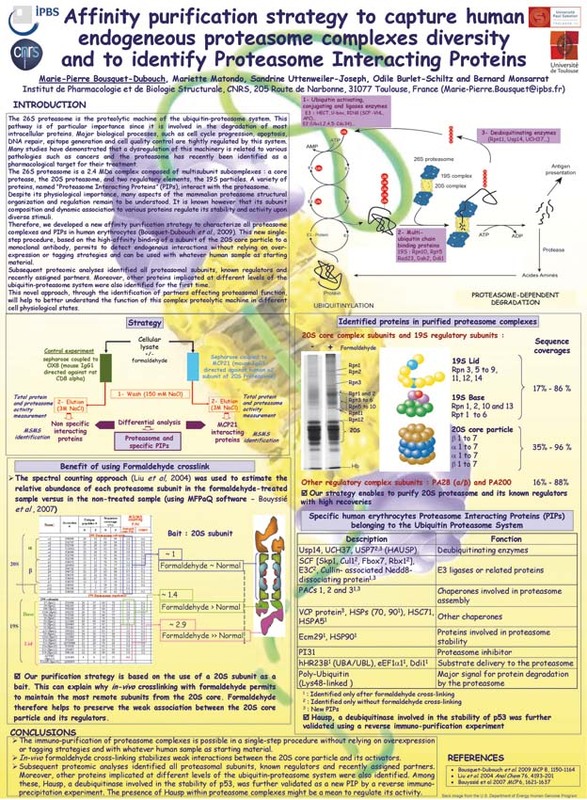 The immuno-proteasome is induced during the immune response in mammals but, together with intermediate-type proteasomes, also exists as constitutive proteasome complexes, depending on tissues or cell type, and can have distinct proteolytic activities. The functional roles of these different proteasome subtypes are largely unresolved. Given the broad function of proteasomes, in quality control, antigenic peptide generation or short-lived protein-tuned regulation, the cell is likely to adapt proteasome plasticity and dynamics to meet specific subcellular needs or to respond to stress or other stimuli. The highly dynamic state of proteasome complexes, their heterogeneity and instability make them inherently difficult to study. To deal with this, efficient strategies are needed to purify and quantify fully assembled, active proteasome complexes. Proteomic strategies constitute complementary methods to structure determination approaches for the study of protein machines. The association of modern mass spectrometry strategies and efficient biochemical approaches, in particular affinity-purification methods, has been critical for the initial success of functional proteomics. In the goal to efficiently purify all endogenous human proteasome complexes, we have optimized an affinity purification-mass spectrometry (AP-MS) strategy involving in vivo formaldehyde crosslinking to maintain the labile interactions between the 20S core complex and the regulatory complexes (Bousquet-Dubouch et al. Mol. Cell Proteomics 2009, 8:1150). We have developed further the approach to determine the dynamics of proteasome complexes in space (subcellular localization) and time (upon IFNg stimulation) (Fabre et al. Mol. 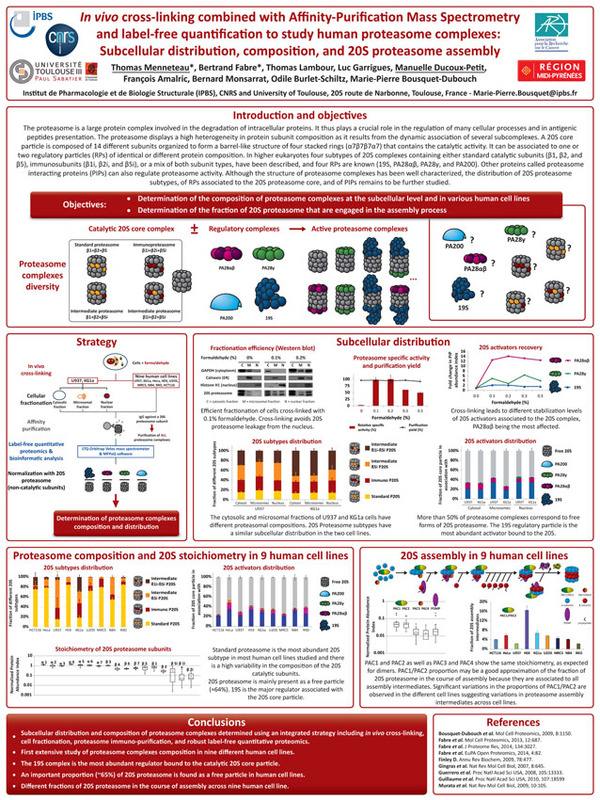 Cell Proteomics 2013, 12: 687). We have extended the determination of proteasome complexes composition in a wide range of human cell lines and showed that proteasome complexes are highly dynamic protein assemblies. Proteasome activity is regulated at different levels by variations in the composition of 20S catalytic subunits, in the stoichiometry of bound regulators, and in the rate of the 20S catalytic core complex assembly (Fabre et al. J.Proteome Res. 2014, 13: 3027). In the goal to determine the relative abundances of the different 26S proteasome subunits, we have then evaluated different label-free quantitative methods. Our results have shown that label free MS1-based quantification methods might represent alternative and straightforward strategies to isotopic dilution MS-based approaches in a stoichiometry oriented objective (Fabre B. et al. 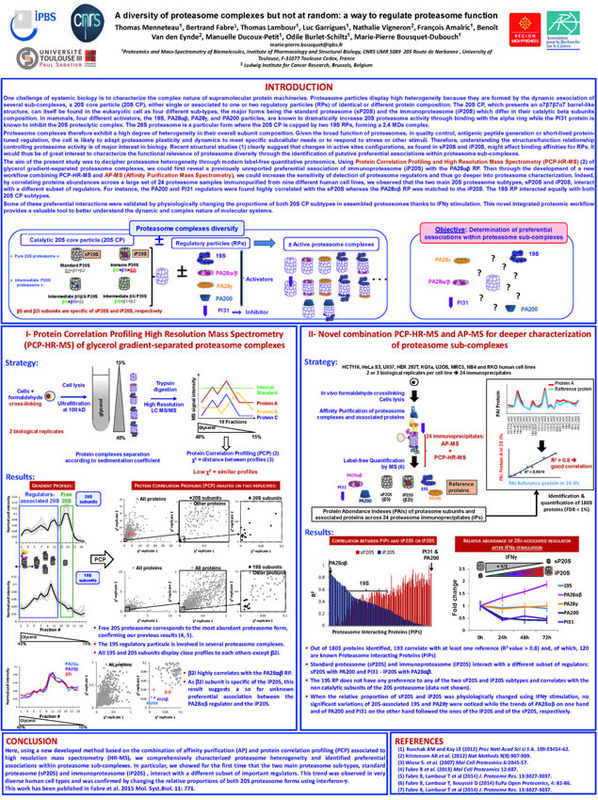 EuPA Open Proteomics 2014, 4: 82-86). The PCP method has been further used to highlight preferential associations of proteasome complexes with other interacting proteins. In particular, it confirmed that FAM192A, renamed PIP30, interacts with PA28γ, a nuclear RP. This proteasome interacting protein (PIP) has first been identified as a specific interactor of the proteasome from nuclear protein extracts by AP-MS. In collaboration with O. Coux (CRMB, Montpellier), we then showed that the interaction of PIP30 with PA28γ affects its association to the 20S and affects PA28γ specificity towards peptide substrates in vitro as well as its interaction with cellular proteins, like coilin a marker of Cajal bodies. Overall, we showed that PIP30 is a major regulator of PA28γ functions and thus of the nuclear functions of the proteasome (Jonik-Nowak B.#, Menneteau T.# et al. Proceeding of the National Academy of Sciences 2018. DOI: 10.1073/pnas.1722299115). 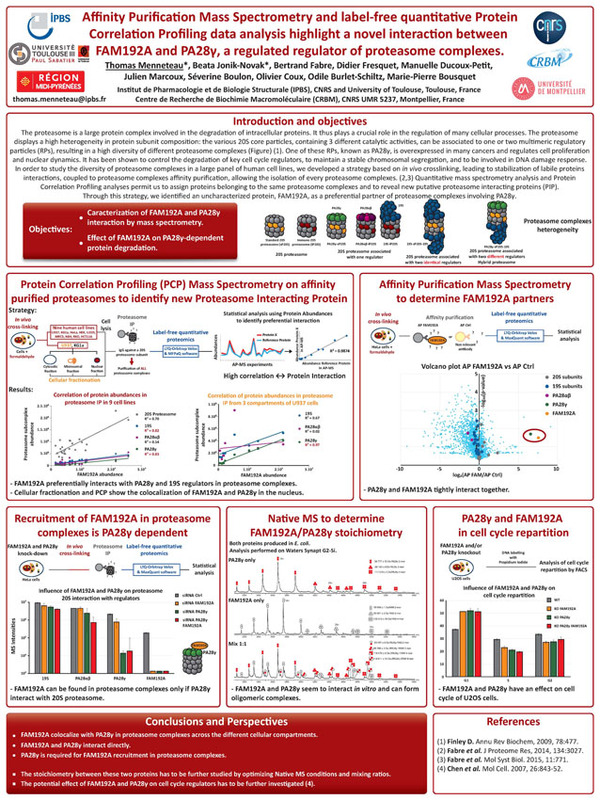 Next, to identify preferential associations within proteasome sub-complexes and to unravel new proteasome interacting proteins, we have developed a new integrated proteomic workflow based on proteasome immunopurification, label-free quantification using high resolution MS, protein correlation profiling, and statistical methods. From a wide set of human cell lines, previously unreported preferential associations within proteasome sub-complexes could be highlighted. We indeed show that the interactions between the different 20S CPs, RPs, and PIPs do not occur randomly. In particular, the two main proteasome sub-types, standard proteasome and immunoproteasome, interact with a different subset of important regulators. Some of these preferential interactions were validated using complementary approaches. (Fabre B. et al. Mol. Syst. Biol. 2015, 11:771. doi: 10.15252/msb.20145497). Finally, we have developed a quantitative MS-based targeted MRM (Multiple Reaction Monitoring) approach to measure the quantity of 20S proteasome subtypes in biological samples (Menneteau et al. Mol. Cell. Proteomics. DOI: 10.1074/mcp.RA118.000958). In collaboration with I. Ader (EFS-Stromalab, Toulouse), we have shown O2-dependent changes in 20S composition during expansion of adipose-derived stem cells (ADSCs) used for cellular therapies. The results show the critical importance of controlling the culture conditions during cell expansion for future therapeutic use in humans. We hypothesize that a shift from the standard proteasome to the immunoproteasome could serve as a predictor of immunosuppressive and differentiation capacities of ADSCs and, consequently, that quality control should include proteasomal quantification in addition to examining other essential cell parameters. The method also provides a new powerful tool to conduct more individualized protocols in cancer or inflammatory diseases where selective inhibition of the immunoproteasome has been shown to reduce side effects. Bousquet-Dubouch, M. P., Baudelet, E., Guerin, F., Matondo, M., Uttenweiler-Joseph, S., Burlet-Schiltz, O. & Monsarrat, B. (2009). Affinity purification strategy to capture human endogeneous proteasome complexes diversity and to identify proteasome interacting proteins. Mol Cell Proteomics. 8: 1150 - 1164. F1000 9.0 Exceptional. Bousquet-Dubouch, M. P., Nguen S., Bouyssié D., Burlet-Schiltz O., French S.W., Monsarrat B., Gorce-Bardag F. (2009). Chronic ethanol feeding affects Proteasome Interacting Proteins. Proteomics. 9: 3609-3622. Matondo M, Bousquet-Dubouch MP, Gallay N, Uttenweiler-Joseph S, Recher C, Payrastre B, Manenti S, Monsarrat B, Burlet-Schiltz O. (2010). Proteasome inhibitor-induced apoptosis in acute myeloid leukemia: A correlation with the proteasome status. Leuk Res. 34(4): 498-506. Guillaume B, Chapiro J, Stroobant V, Colau D, Van Holle B, Parvizi G, Bousquet-Dubouch MP, Théate I, Parmentier N, Van den Eynde BJ. (2010) Two abundant proteasome subtypes that uniquely process some antigens presented by HLA class I molecules. Proc Natl Acad Sci U S A 107(43):18599-604. Uttenweiler-Joseph S, Bouyssié D, Calligaris D, Lutz PG, Monsarrat B, Burlet-Schiltz O. (2013) Quantitative proteomic analysis to decipher the differential apoptotic response of bortezomib treated APL cells before and after retinoic acid differentiation reveals involvement of protein toxicity mechanisms. Proteomics.13(1):37-47. Guillaume B, Stroobant V, Bousquet-Dubouch MP, Colau D, Chapiro J, Parmentier N, Dalet A, Van den Eynde BJ (2012). Analysis of the Processing of Seven Human Tumor Antigens by Intermediate Proteasomes. J. Immunol. 189(7):3538-47. Fabre B, Lambour T, Bouyssié D, Menneteau T, Monsarrat B, Burlet-Schiltz O, Bousquet-Dubouch MP. Comparison of label-free quantification methods for the determination of protein complexes subunits stoichiometry. 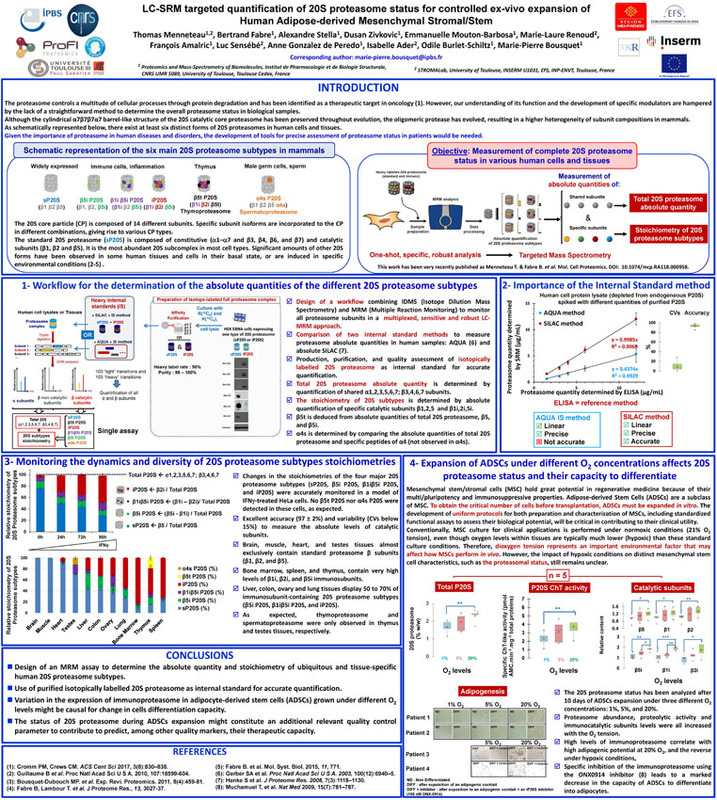 EuPA Open Proteomics 2014, 4: 82-86. Matondo M, Marcellin M, Chaoui K, Bousquet-Dubouch MP, Gonzalez-de-Peredo A, Monsarrat B, Burlet-Schiltz O. Determination of differentially regulated proteins upon proteasome inhibition in AML cell lines by the combination of large-scale and targeted quantitative proteomics. Proteomics. 2017 Apr;17(7). doi: 10.1002/pmic.201600089. Sbardella D, Tundo GR, Coletta A, Marcoux J, Koufogeorgou EI, Ciaccio C, Santoro AM, Milardi D, Grasso G, Cozza P, Bousquet-Dubouch MP, Marini S, Coletta M. (2018) The insulin-degrading enzyme is an allosteric modulator of the 20S proteasome and a potential competitor of the 19S. Cell Mol Life Sci. 2018 Sep;75(18):3441-3456. doi: 10.1007/s00018-018-2807-y. Jonik-Nowak B#, Menneteau T#, Fesquet D#, Baldin V, Bonne-Andrea C, Méchali F, Fabre B, Boisguerin P, de Rossi S, Henriquet C, Pugnière M, Ducoux-Petit M, Burlet-Schiltz O, Lamond AI, Fort P, Boulon S, Bousquet MP*, Coux O*. (2018) PIP30/FAM192A is a novel regulator of the nuclear proteasome activator PA28γ. Proc Natl Acad Sci U S A., 115, E6477-E6486. Menneteau T#, Fabre B#, Garrigues L, Stella A, Zivkovic D, Roux-Dalvai F, Mouton-Barbosa E, Beau M, Renoud ML, Amalric F, Sensebe L, Gonzalez-de-Peredo A, Ader I, Burlet-Schiltz O*, Bousquet MP*. Mass spectrometry-based absolute quantification of 20S proteasome status for controlled ex-vivo expansion of Human Adipose-derived Mesenchymal Stromal/Stem Cells. Mol Cell Proteomics. 2019 Jan 30. pii: mcp.RA118.000958. doi: 10.1074/mcp.RA118.000958.